I continue the seeming never-ending process of decluttering my house. Not because my house is a mess, or I am a possible contender for the hoarders show, just because life happens and stuff accumulates. As I go through my files, look into my office closets I’m feeling into what it will be like to be a person who is current in my life. Clothes in the closet that I love and wear. Outdated paper shredded and no more. Kitchen gadgets I hardly ever if ever use donated to Good Will. I’ve hired someone to help me learn new behavior so I can grow into that person. Because I set the time aside, booked the appointment and paid for it, I end up taking the actions necessary to create the results I want. I’m not going to let my distracting patterns get in the way of completing the task at hand when someone is there for and with me assisting me as I cross the finish line. 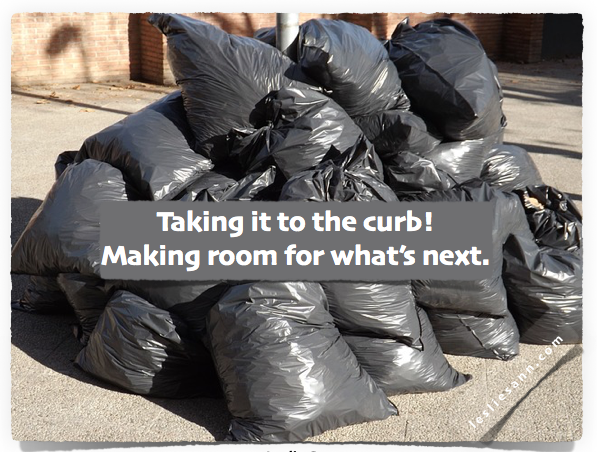 What is no longer needed will be taken to the curb and what is currently useful to me will be left behind. I was on the phone with a woman who was inquiring about coaching. Many folks aren’t clear about the distinction between coaching and therapy. When a person coaches with me, there is a fee paid in advance for a certain period of time which includes a specific amount of sessions. It is akin to paying your tuition up front and then going to class, doing the homework, studying the materials, passing the tests, in order to have the joy of walking across the stage to pick up your diploma. In the world of coaching your diploma is the experience you hired your coach to help you create. I shared with her that taking that which is no longer needed in my home to the curb is much the same as the experience she could have by working with me. She would learn to take the limiting thoughts, hurtful thinking, thinking about her thinking, well-analyzed problems to the curb and live in a more up to date, current inner reality that would foster more joy and upliftment. This woman loves that she has the opportunity to hire her own mentor as she takes all the information she has learned in her life and uses it to transform herself. She has read a ton of books. In our call she quoted several wise people. She has taken many workshops. She is quite intelligent and quick minded, yet she was aware that it was all information. She has not yet created the intrinsic change that was necessary for the transformation she is wanting. Folks think reading about change creates change. Others go to workshops. Lots of people talk about it. I for one have a Living Vision for my Open Space Project replete with affirmations and a treasure map. I could tell you about what has been in the way up until now and where I’m stuck and blah blah blah. Yet not until I actually take the trash to the curb, do the work necessary to create what I want will I have anything close to that pretty collage I have created to inspire me. Doing is the only thing that does it.